An annual survey of law firms reveals broad cynicism in the industry about the effects of the Legal Services Bill. 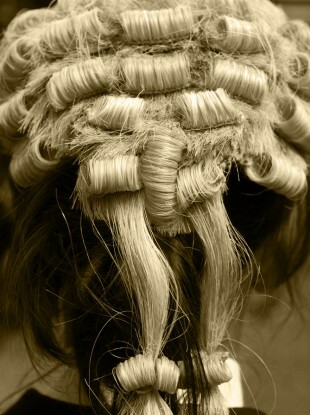 Among the many provisions of the proposed new laws is the abandonment of the traditional court wigs and robes for barristers. A CLEAR MAJORITY of Irish law firms have said they do not expect Alan Shatter’s legislation on reforming the legal profession to lower the fees they charge to clients. An annual survey carried out by financial services firm Smith & Williamson showed that 72 per cent of solicitors’ firms did not expect the Legal Services Regulation Bill to have an impact on the fees they charge. The legislation was approved by the Cabinet in October 2011 and introduced to the Oireachtas shortly afterward, but has languished at committee stage for nearly a year, pending discussion on amendments suggested by TDs. Shatter had heralded the bill as offering “greater transparency for legal costs and greater assistance and protection for consumers of legal services”. The system would also set up a new body to investigate allegation of professional misconduct, and to adjudicate on disputes over the amount being charged by legal practitioners for their services. The survey also showed that only one in four firms supported regulation by an independent body. Currently the Law Society regulates the enrolment, conduct and business of solicitors, but it does not regulate solicitors’ practices. That body has vocally criticised the provisions of the legislation, which it believes gives indirect control of the industry to the government itself. This is because the legislation would set up a new Legal Services Regulatory Authority which would take over the existing legal functions of both the Law Society and the Bar Council, which regulates barristers. The new authority’s board would feature a majority of members appointed by the minister. There was slightly warmer response to the Bill’s proposal to allow solicitors and barristers to practice together, something which is formally barred under current rules which prohibit barristers from having explicit roles in law practices. 40 per cent of respondents were in favour of that idea. Author’s note: This article previously stated that the survey was commissioned by the Law Society. In fact, that body had no role in commissioning the survey. We are happy to correct this. Email “Majority of solicitors don’t expect legal change to cut fees”. Feedback on “Majority of solicitors don’t expect legal change to cut fees”.